Norris A. Kessler, III, better known as "Nick," is a graduate of The University of Memphis School of Law in Memphis, Tennessee. He was born in Shelby County and raised in Maury County. Nick Kessler moved to Franklin County and has become well known and respected in the Franklin County community where he has been practicing law since 2003. He has developed a reputation for covering every angle for his clients. While in law school, Nick Kessler was a member of The University of Memphis law review. He continues the same success practicing law where he has developed diverse legal experience in personal injury, workers compensation, criminal defense, family law, Social Security Disability and bankruptcy law. Nick Kessler prides himself as a litigator spending a great amount of his time in the courtroom. 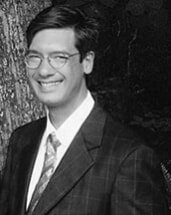 Nick Kessler controls the legal library at the law firm ensuring that the recent developments at the Legislature, United States Supreme Court, Tennessee Supreme Court and the Appellate Courts are applicably put to work to assist the attorneys of Davis, Kessler & Davis. He possesses the skillful art of deciphering complex opinions ensuring that every advantage is discovered and tactfully employed.